Getting from Bangkok to Pattaya is now easier than ever. Over the last decade or so the authorities have invested heavily in Highway 7, making this the most convenient and direct route to Pattaya. The new road has dramatically cut the journey time, but at a cost. The tolls charged a varying points along the route add the cost of your journey. Pattaya is approximately 145km south of Bangkok and the journey can be done in under 2 hrs from hotel to hotel. This close location and ease of journey all make Pattaya the favored choice for those in Bangkok looking to escape the hustle and bustle for a few days in the famous resort. Lots of frequent travelers means lots of different operators and choice for the traveler. Deciding on the best option for your journey from Bangkok to Pattaya is not an easy task. Fortunately for you, we have experienced most of the options and can guide through the process. Travelling by bus is probably the most difficult choice. There are so many different operators, classes of travel and departure points to choose from. For most people the idea of first class travel means the best of the best and pure luxury. Well not here in Thailand where it generally means, a comfortable seat and A/C. In fact a first class bus here is probably similar to an average bus back home. The seats are comfortable and recline a little, and the A/C is welcoming. Most buses will have a toilet on board but you will need to brave or desperate to use it. Buses leave on average ever thirty minutes or so. First class buses are extremely popular with both Thai’s and foreigners and buses sell out. If you turn up at the station you may have to wait until there is a seat on bus available, sometimes several hours at peak times. Tickets cost less than 120thb and are best bought in advance to guarantee your spot. You can buy tickets a few hours to weeks in advance. The journey to Pattaya will take around 2hrs depending on time of day. The second class buses will take the old highway which makes the journey time 2hrs 45mins on average, they have less comfortable seats, the A/C can be intermittent and there are no toilets on board. Second class buses also have a tendancy to break down making journey times a lot longer. In our opinion not really wirht saving the 20thb. Located next to Ekkamai BTS station on Sukhumvit road, next to soi 63. 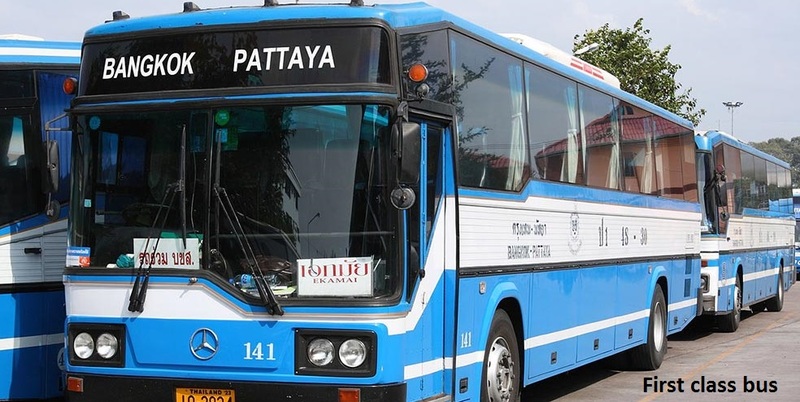 The eastern bus station is the busiest station to get the bus to Pattaya. It is conveniently located for anyone staying the center of Bangkok and is just a short stroll from the BTS stop. 1st class buses leave Ekkamai every thirty minutes or so (you have to make allowances for Thai time keeping). The earliest bus leaves at 0520 and the last at 2320, an services operate every day of the week. The Northern bus terminal is located in the Mochit area of Bangkok and is also fairly easy to get to by BTS. The journey time to Pattaya is a little longer from the Northern station, and it is advisable to get use the Eastern station. However getting a seat on a bus is much easier and they rarely fill up. 1st class buses also leave here approximately every thirty minutes from early morning. A word of caution the service stops at 2000 (8pm). The Southern terminal is not so easy to get to if your staying right in the center of Bangkok, but is the closest to Khao San road. If your are staying in the popular backpacking district this is the best option for you. Journey times from here to Pattaya are a little less than the other two terminals. Services are much less frequent than from the Southern terminal. At the time of writing the following services are running 0530, 0830, 1000, 1200, 1400 and 1830 only. Due its popularity with backpackers and fewer services they do fill up and booking in advance is advisable. By far the most popular choice for tourists, expats and the wealthier Thais is a VIP transfer. These privately owned and operated minivans operate from all over the city. The minivans are the high end, they hold 9 persons at a time and can be hired as purely private or join in with others on a pay per person basis. Inside the seats are super luxurious, leather and recline into an almost cradle like position. We find the drivers like the A/C a little too much, and whilst it is refreshing when you first enter, it becomes cold after a while. Have a jumper or hoodie to hand. These are much quicker than buses and journey times are 1hr 45mins on average. For approximately 300-400thb you can arrange for the driver to pick you up at your hotel and drop you at your next hotel in Pattaya. This is by far the most convenient method of getting from Bangkok to Pattaya, especially if you have luggage in tow. No need to cart your bags up and down the stairs on the BTS just to get to the bus terminal. The driver will more than likely have to stop at a couple of other places to pick up the rest of the passengers. In most cases this is well thought out and they will be in nearby hotels, so it doesn’t add to the journey time much. The other option instead of door to door is to head to one set starting points such as victory monument, here you can jump straight into a departing minivan and get on your way. You will be dropped at one of several points in Pattaya, the bottom of South Pattaya road is the most popular location. From here you can easily walk to beach or second road hotels. Or if your staying further out jump in one the baht buses near by. These are cheaper than the door to door service and cost 200thb if there is a lot of business going around, but tickets can be bought for 150thb out of main season. 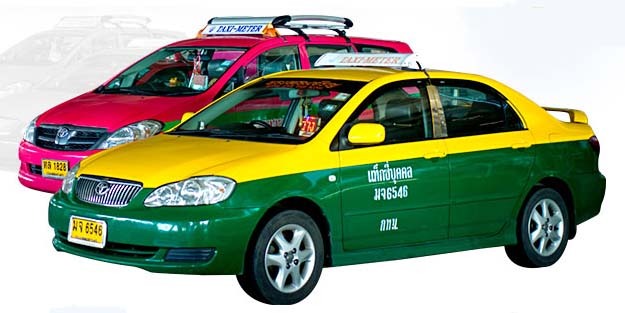 The easiest and most private method is to get a taxi from Bangkok to Pattaya. However this is also the most expensive option. Prices will vary greatly depending on many factors. The time of day, traffic, number of passengers and type of vehicle will all contribute to the cost. One of the easiest ways is to get your hotel to arrange the taxi for you. They will all have taxi operators they use regularly and trust. The main benefit though is they will negotiate the price on your behalf, meaning no surprises at the other end. You can of course grab a taxi from the street outside your hotel and negotiate a fixed price yourself. There are two types of taxi cabs available “metered cabs” and “non metered”. We would recommend only using metered cars. This basically means the driver is licensed and regulated. Non metered means you are getting into un regulated car, with and unlicensed driver. Metered cabs are easy to spot they are liveried in bright colors and have a light box on the top. The drivers operators license should also be easily visible. Prices as mentioned vary, but a reasonable price in a metered taxi is 1500 thb door to door including toll charges. Make sure you specify the tolls are included. Bangkok has 2 airports Don Mueng to the north and Suvarnabhumi to the south. If your flying in on any of the major international airlines you will land into Suvarnabhumi (BKK). BKK is actually closer to Pattaya than the center of Bangkok. However being an airport prices are more expensive than from the city. But still more convenient and cheaper than heading into and then back out of the city. Private transfer is available by either taxi or minivan from the airport to Pattaya. Private journeys can take a little over an hour and will drop you at your hotels door. If you have not made prior arrangements then head to the taxi area on the lower level where you will can easily grab a cab. Prices are set before you even approach your car and will set you back 2000thb. It is far more convenient to pre-arrange your transfer to Pattaya. This way as soon as you clear customs your driver will be waiting with a sign bearing your name. He will walk you out the car park and your vehicle and your on your way. Prices are a more reasonable 1300-1500thb depending on season. Journey by private vehicle will take approximately an hour. Still have questions regarding getting from Bangkok to Pattaya? Then leave a comment below and we will reply as best we can to answer your questions.